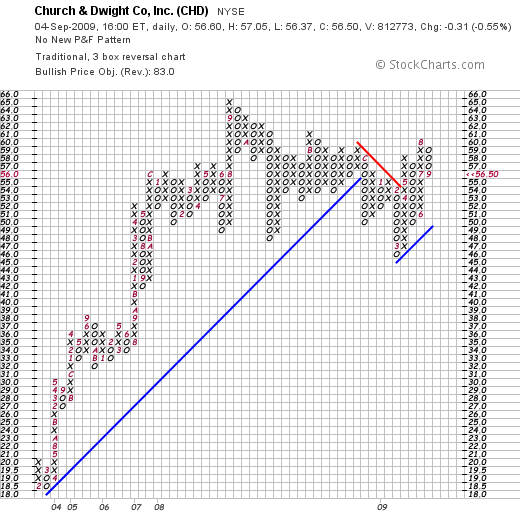 Church & Dwight (CHD) "Revisiting a Stock Pick"
I apologize to my readers for my relative paucity of posts to my blog. I am committed to continuing to share my ideas with all of you and certainly to continue to offer you my actual experience in my own trading account. The economic deterioration appears to have slowed in intensity yet it has not yet reversed direction. As reported the other days, the national unemployment rate as of August, 2009, has reached 9.7%, the highest level since June, 1983. The economy shed 216,000 jobs in August, an awful figure yet a continuation of the gradual improvement from June, 2009 when the number was 463,000 jobs lost and July, 2009.when 276,000 jobs disappeared. Suddenly less bad news is becoming good news! On another cautiously optimistic note we are also seeing improvement in the housing number figures. Sales of new homes rose 9.6% in July 2009, making it 3 months in a row of improved figures. Bank failures continue to be reported; we are up to 84 this year, from 25 in 2008 and 3 in all of 2007! And retail sales remain week with sales in August 2009 dipping an average of 2.9% with the only good news being that it wasn't as bad as was expected---analysts had been looking for a 3.8% decline according to a survey by Thomson Reuters. Considering this bearish although seemingly improving environment, it is no wonder that an amateur investor like myself has grown increasingly conservative in my own approach. But my philosophy hasn't really changed in terms of the kind of stocks and the kind of financial underpinnings to those companies that make me personally find them attractive for consideration. I would like to share with you another look at Church & Dwight (CHD), a stock that I first reviewed back in January 31, 2006 here on this blog, when it was trading at $36.80. I still do not own any shares of this company but it is one that is on my own investing horizon. Church & Dwight (CHD) closed at $56.50 on September 4, 2009, down $.31 or (.55)% on the day. "...together with its subsidiaries, develops, manufactures, and markets a range of household, personal care, and specialty products under various brand names in the United States and internationally. The company operates in three segments: Consumer Domestic, Consumer International, and Specialty Products. The Consumer Domestic segment offers household products for deodorizing, such as ARM & HAMMER baking soda and cat litter products; laundry and cleaning products, including XTRA and ARM & HAMMER laundry detergents, OXICLEAN pre-wash laundry additive, SCRUB FREE, KABOOM, ORANGE GLO, and BRILLO cleaning products; and personal care products, such as TROJAN condoms, ORAJEL oral analgesics, NAIR depilatories and waxes, FIRST RESPONSE and ANSWER home pregnancy and ovulation test kits, ARRID and ARM & HAMMER antiperspirant, and SPINBRUSH battery-operated toothbrushes. The Consumer International segment primarily sells various personal care products in international markets, including France, the United Kingdom, Canada, Mexico, Australia, Brazil, and China. The Specialty Products segment produces sodium bicarbonate, which it sells together with other specialty inorganic chemicals for a range of industrial, institutional, medical, and food applications." In other words, they are a rather diversified consumer business providing for basic needs in many markets worldwide. Let's take a look at a few of the financial numbers that make me more convinced of the suitability of this 'stock pick' for my blog. First of all, as I like to do, let's review the latest quarterly financial result. On August 4, 2009, CHD reported 2nd quarter results. For the quarter ended June 26, 2009, earnings came in at $58.2 million or $.81/share. This was up from $45.8 million or $.66/share the prior year same period. Sales for the quarter increased to $623.1 million from $594 million. Thus it wasn't a bad quarter at all for Church & Dwight! More importantly perhaps to anticipate the stock price reaction to any piece of news, is what analysts were expecting. In this case, analysts polled by Thomson Reuters had been expecting net income of $.79/share on revenue of $611.5 million. Thus CHD beat expectations on both earnings and revenue results! In addition, it is also a big plus in my book if we can hear something positive from management within these announcements regarding future results. In fact CHD went ahead and raised earnings expectations for the year to a range of $3.36 to $3.40/share from prior guidance of $3.30 to $3.35 per share. Analysts according to Thomson Reuters had previously been expecting profit of $3.35/share. Thus the guidance was above expectations! As if this wasn't enough, the company went ahead and announced a significant increase in the dividend from $.09/share to $.14/share. So while we have many stocks with revenue dips, uncertain guidance, and dividend cuts, Church & Dwight comes out and knocks one 'right out of the park'! There are many places to find this sort of information. For several years now I have been utilizing Morningstar.com which provides the individual investor what I believe to be a very useful amount of information. 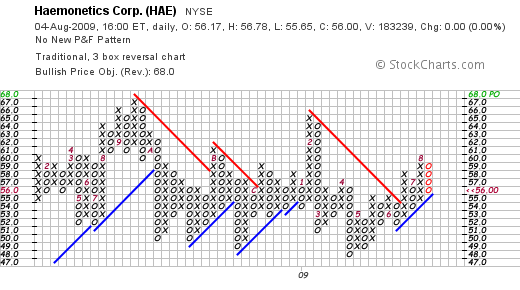 In particular, the "5-Yr Restated" financials on Church & Dwight (CHD) is a very useful place to start. Here we can see clearly illustrated the steady increase in revenue from $1.4 billion in 2004 to $2.42 billion in 2008 and $2.48 billion in the trailing twelve months (TTM). Earnings have also steadily increased from $1.36/share in 2004 to $2.78/share in 2008 and $3.00/share in the TTM. Dividends are not only paid to shareholders but they also have been steadily increased from $.21/share in 2004 to $.34/share in 2008 and $.36/share in the TTM, with a new indicated payment of $.56/share going forward as I just noted above. Outstanding shares, where I might actually prefer to see a diminution of numbers, have only been modestly increased from 68 million in 2004 to 71 million in 2008 and the TTM. Free cash flow is positive and steadily increasing. $139 million reported in 2006, up to $336 million in 2008 and $400 million in the TTM. The balance sheet appears solid with $357.0 million in cash and $481.0 million in other current assets per Morningstar with $500.9 million in current liabilities yielding a current ratio of approximately 1.8. The company does have $1.03 billion in long-term liabilities on its books. Looking at Yahoo "Key Statistics" on CHD, we see that the company is a mid-cap stock with a market capitalization of $3.97 billion. 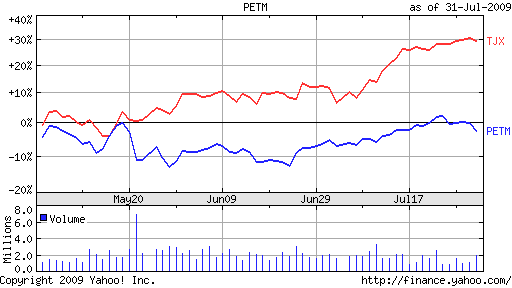 The trailing p/e is a moderate 18.80, with a forward p/e estimated at 14.75. The PEG suggests a reasonable p/e valuation with a value of 1.32. There are 70.3 million shares outstanding with 64.78 million that float. As of 8/11/09, there were 2.92 million shares out short, yielding a mildly significant short interest ratio of 4.2. (I assign 'significance' on this ratio when there are over 3 days of short interest needed to be covered in case of a 'squeeze'). The company pays a forward dividend of $.56/share yielding 1.00%. With a payout ratio of only 12%, this dividend appears to be relatively secure. The stock was last split back in September, 2004, with a 3:2 stock split. 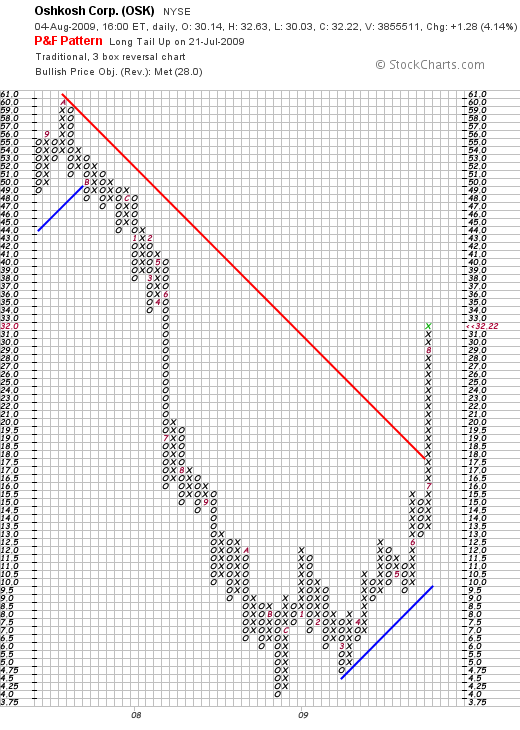 If we look at a "point & figure" chart on Church & Dwight (CHD) from StockCharts.com, we can see that the stock price made a strong move from February, 2003 when the stock was trading at around $18.50 to a high of $65 back in September, 2008. Since that time, along with the rest of the market, the stock has traded sideways, but recently, in April, 2009, broke through resistance at $54 and now is trading in an upward direction above support levels. To summarize, I don't really much like the economic environment that we find ourselves. Who does? We have all watched our 401k's and IRA's and personal accounts get clobbered as the economy slipped into recession and the market into a devastating bear market. Things do look a bit more hopeful recently. To select stocks in this environment is treacherous. But if we can think about any particular type of company that might survive in this environment, a consumer staples company like Church & Dwight (CHD) might fit the bill. As I have noted, in the latest quarter they reported increasing revenue, increasing earnings, beat expectations on both and raised guidance. They also raised their dividend! But these are not one-time events. This company has been performing like this for years! Valuation is reasonable if not cheap. The stock chart appears reasonably optimistic in face of a difficult investing world. I continue to employ my own investing strategy of waiting for my own holdings to advance to targeted appreciation levels before adding a new position and limiting my losses on the downside. But if I am given the opportunity to buy something new, this is the kind of stock that I shall be considering! Thanks again for dropping by and visiting. 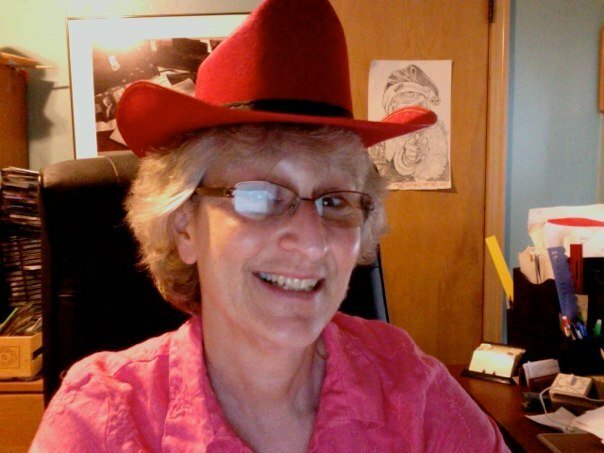 I do not blog as often as I have and probably should, but I appreciate your visits, your comments, and your occasional encouragement! If you have any comments or questions, please feel free to reach me at bobsadviceforstocks@lycos.com. I set out tonight to write up an entry about a suitable stock to add to my blog. But nothing seemed right. I scanned through the list of the top % gainers, my usual starting place, but there were few stocks over $10. And when the few names I found seemed to have potential their latest earnings were in general a little less than exciting. Financial results are reported that are mediocre yet because they are ahead of the already more dismal expectations, the stock rises. Not enough in my book. Briefly, I am still looking for stocks making moves higher with solid recent earnings reports, a record of steadily improving financial results, reasonable valuation, and a decent charty. O.K. so I want everything :). But why not. 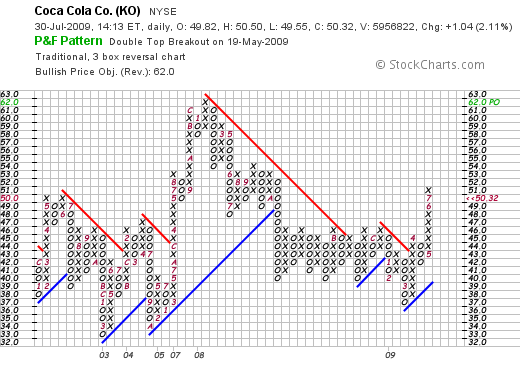 In my own portfolio I have caught myself chasing performance swapping out of Colgate (CL) for Coca-Cola (KO). 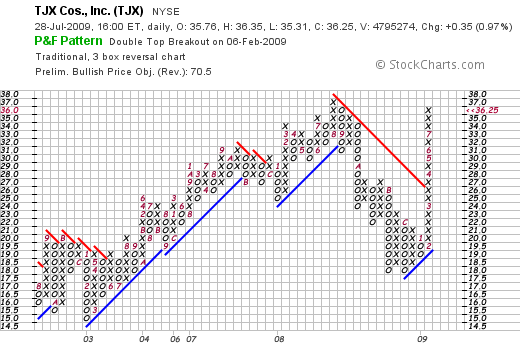 Moving from Haemonetics (HAE) to Oshkosh (OSK), switching from PetSmart (PETM) to TJX (TJX). Perhaps if I had been a bit wiser, I would have understood that my own frustration with my own account was merely a frustration with the overall market that was influencing my own holdings. With nothing wrong with the previously held stocks, their resistance to upward price appreciation, was merely a reflection of the difficult stock market. Chasing performance hasn't worked. 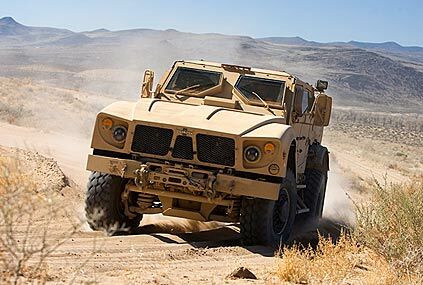 Oshkosh (OSK) was sold after incurring a loss. 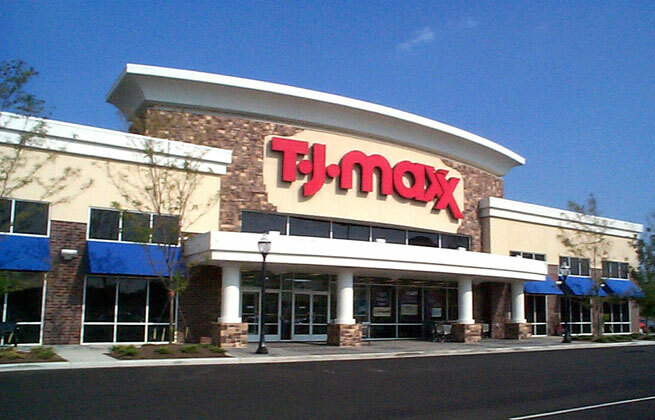 The only possible improvement was the pick-up with TJX, which itself is in the process of consolidation after a large price appreciation this year. I am back to my disciplined investment system. I shall hold onto stocks in my portfolio until they either incur losses, incur large gains, or actually report major financial problems. 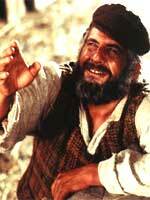 I cannot argue more about trusting your strategy, implementing your strategy, and keeping your cotton-pickin' hands off the stocks when you shouldn't be messing with your own plans. Time and time again, I discover my own trading flaws that keeps me as an amateur, no matter how many blog entries I can accumulate on this website. If you have any comments or questions, please feel free to email me at bobsadviceforstocks@lycos.com or leave them right here!